As with any laboratory test, Hevylite results should be interpreted alongside a patient’s clinical details and other laboratory tests. When serial monitoring data is available, results should be compared with previous measurements to check they are consistent and to identify trends. A number of published normal reference intervals are available for Hevylite assays. These are discussed further in Chapter 10. Users are recommended to either establish their own local ranges or validate an existing reference interval. A raised concentration of one HLC type, with an abnormal HLC ratio is indicative of monoclonal immunoglobulin production. Renal impairment is not known to influence HLC results, since intact immunoglobulin molecules are not cleared by the kidney (Chapter 3). Figure 11.1. 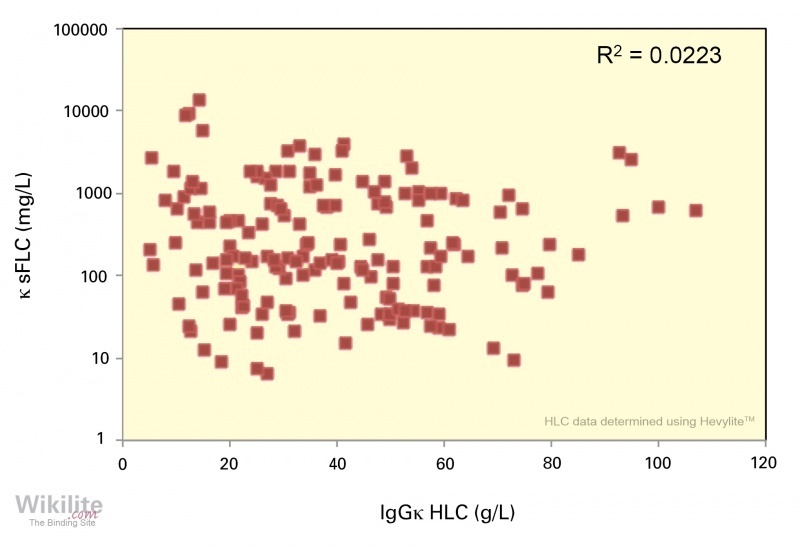 HLC dot plot showing results for 56 patients with IgA MM. Solid squares: patients with monoclonal IgA that could be quantified by SPE; open squares: patients with anodal migration of their monoclonal IgA, which made accurate quantification impossible. (Reprinted by permission from Macmillan Publishers Ltd: Leukemia ; copyright 2013). In some cases it may be helpful to plot an individual patient’s result (or an entire cohort of patients’ results on a HLC dot plot Figure 11.1). 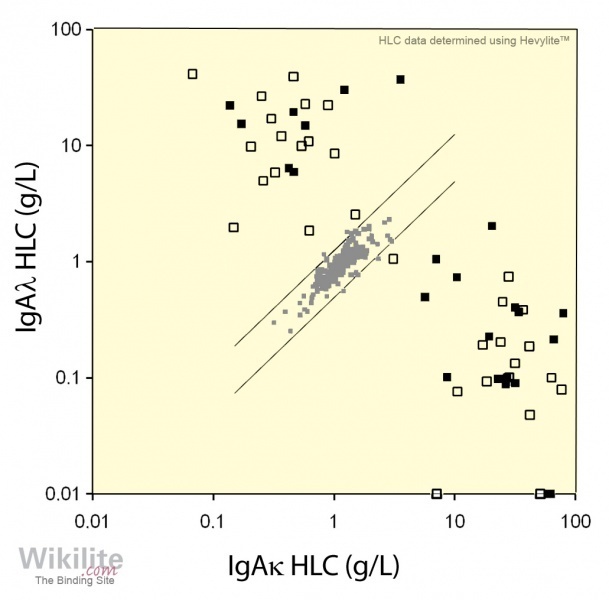 This is a graph displaying Ig’κ HLC concentrations (x-axis) against Ig’λ HLC concentrations (y-axis), both on logarithmic scales. The limits of the normal reference interval for the Ig’κ/Ig’λ HLC ratio are represented by two parallel lines. Each patient result is represented by a single point. If the Ig’κ/Ig’λ HLC ratio is normal, the result will fall within the normal reference interval. A result that lies outside the normal reference interval is consistent with the presence of a monoclonal intact immunoglobulin. Intact immunoglobulins (and therefore Hevylite measurements) and FLCs are independent tumour markers. For example, a plot of IgGκ HLC vs. κ sFLC concentrations for 170 IgGκ MM patients showed no correlation between the two parameters (Figure 11.2). This important point is discussed further in Section 17.2. Knowledge of the biological variation of HLC in serum is useful when interpreting monitoring data for individual patients. Jabor et al. published IgG, IgA and IgM Hevylite biological variation data for 19 healthy individuals (10 male, 9 female) generated from weekly blood samples taken over the course of 7 weeks. The results from the SPAPLUS® analyser demonstrated acceptable analytical variation (CVA), for all HLC specificities, the within-subject variation (CVI) was less than the within-group variation (CVG) (Table 11.6). The reference change value (RCV) defines the minimum difference between two consecutive measurements from the same individual, which can be considered significant (p<0.05). In this study the RCV for all analytes was less than 20%. This indicates that a clinically significant change in the immunoglobulin concentrations may be smaller than the reference interval, and highlights the importance of monitoring with HLC to detect potentially significant changes during follow up. These results agree with those published for Hevylite IgG and IgA in a previous paper by Finlay et al. Table 11.6. Biological variation of HLC. CVA: analytical variation; CVI: within-subject variation; CVG: within-group variation; II: Index of Individuality; RCV: reference change value.